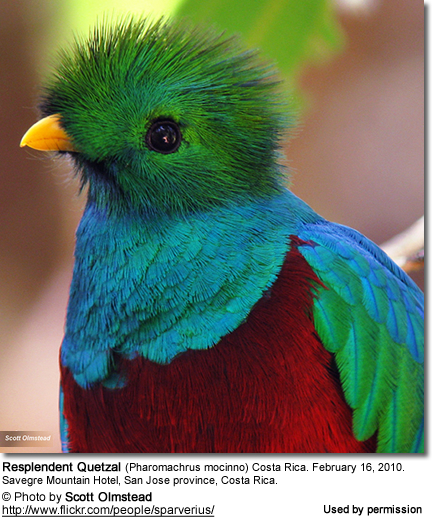 Quetzals are brightly-colored birds that occur naturally in the tropical regions of the Americas. Crested Quetzal (Pharomachrus antisianus) - Found in South America - in Bolivia, Colombia, Ecuador, Peru and Venezuela. Golden-headed Quetzal (Pharomachrus antisianus auriceps): Found in Panama south through Colombia and Venezuela to Northern Bolivia. White-tipped Quetzal (Pharomachrus fulgidus) - Found in South America: Venezuela, Colombia, and Guyana. Resplendent Quetzal (Pharomachrus antisianus mocinno): Found in southern Mexico south through Guatemala, Honduras, El Salvador, Nicaragua and Costa Rica to western Panama. Pavonine Quetzal (Pharomachrus pavoninus) - Found in the Amazon Basin of the North Region, Brazil, Amazonian Colombia, Ecuador, Peru, and northern Bolivia; also regions of Venezuela. Eared Quetzal (Pharomachrus antisianus neoxenus) - Found in Mexico, with some rare records from southwestern United States.